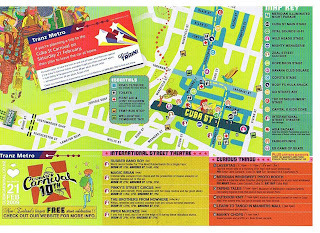 Should one have picked up a copy of the Dom Post today, out would have fallen a map and set list for the Cuba Street Carnival. And we're on it! Woo! Can't really tell in the scan above, but no matter. Woo all the same! Thanks! Stop by anytime... that would be pretty chill, a global knit graffiti party, oh the possibilities. I just checked out the carnival website, that looks like tons of fun good luck over there!